The aim of the FMICS workshop series is to provide a forum for researchers who are interested in the development and application of formal methods in industry. In particular, these workshops are intended to bring together scientists and practitioners who are active in the area of formal methods and interested in exchanging their experience in the industrial usage of these methods. These workshops also strive to promote research and development for the improvement of formal methods and tools for industrial applications. 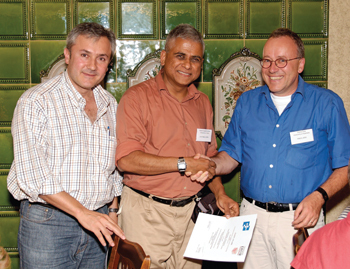 From left: Pedro Merino ERCIM FMICS Working Group coordinator and workshop co-organiser; Ganesh Gopalakrishnan winner of the FMICS best paper award; and Stefan Leue, University of Konstanz, workshop co-organiser. The workshop included five sessions of regular contributions and three invited presentations, given by Charles Pecheur, Thomas Henzinger and Gérard Berry. In addition to the participant's proceedings, a volume in the Lecture Notes in Computer Science (LNCS) series published by Springer Verlag will be devoted to FMICS 2007. The papers included in the LNCS volume were selected from a second round of peer reviewing. FMICS 2007 attracted 33 participants, some of them are members of the FMICS Working Group, from fourteen different countries. We wish to thank the members of the programme committee and the additional reviewers for their careful evaluation of the submitted papers (fifteen papers have been selected out of 31 submitted). We are very grateful to the local organisers of the CAV conference and to University of Dortmund for allowing us to use their online conference service. Following a tradition established over the past years, the European Association of Software Science and Technology (EASST) offered an award to the best FMICS paper. This year's award was given to Robert Palmer, Michael DeLisi, Ganesh Gopalakrishnan and Robert M. Kirby for their paper 'An Approach to Formalization and Analysis of Message Passing Libraries'.